𝓗𝓲 𝓘 𝓪𝓶 𝓡𝓮𝓭 𝓪𝓷𝓭 𝔀𝓮𝓵𝓬𝓸𝓶𝓮 𝓽𝓸 𝓶𝔂 𝓹𝓻𝓸𝓯𝓲𝓵𝓮. I'm looking forward to it as well! 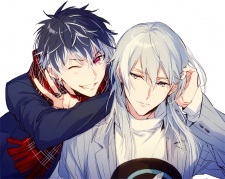 Overall, my favorite character is Gaku (though I am a little biased because I'm a fan of his voice actor). I also love Mitsuki, Momo, and Riku! I see, Oh! why you don't watch that much like you used to busy at school? btw your profile pic is that from an anime? Please remember to save and rehost. CTRL+F to find it faster. How are carbs bad? I was told they take up a large proportion of our diets. i only like rain when i'm inside, i love the sound of it when it like hits the window and the ground, but as soon as it rains when i'm outside and i don't have an umbrella/coat well i'm not gonna be happy :c aw i see, i know how it feels to get anxious, i get anxious about a different kind of thing which doesn't occur a lot so my anxiety doesn't normally show. yeah literally same, i need a book that can catch me at the beginning and then hold me for the whole book. i think my favourite book of all time is maybe someday by colleen hoover, the quote on my profile is by her. i also love romance again, gosh i am a hopeless romantic, but i do like franchises like harry potter and maze runner. what would you say is your favourite book/genre? Btw how long have you been watching anime? There is nothing to forgive. I am late myself ^^ Hope you are fine. Good luck with the moving!